Diaspora + Fait Accompli: A New Formula for Force Projection? The Russian takeover of the Crimea offers a possible blueprint for non-Western powers. 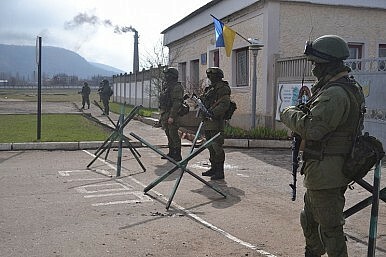 Although the outcome of Russia’s rapid military deployment in the Crimea is not yet certain, this incident and Russian military action against Georgia in 2008 may offer non-Western powers a potential formula for the use of force. Neither diaspora nor fait accompli are new concepts for statecraft, but this combination may gradually become more workable in the shifting power structure of the international community. During the Cold War, the tight relations between the West and East Blocs made either diaspora or fait accompli salient in the main areas of confrontation, such as Europe, as any action involving force had the potential escalate into all-out nuclear war. Thus, fait accompli was merely for military operation with a bloc, such as the Soviet Union’s assault on Prague in 1968. In other areas of rampant proxy wars and conflicts, diaspora was less attractive than ideological goals for belligerents seeking to obtain external aid from either of the two blocs, and fait accompli was not durable in lasting combats, whether conventional or insurgency. In the first two decades of the post-Cold War era, the balance of power between Western powers and non-Western powers heavily favored the former. As a result, the Western powers, principally the U.S. and the EU, were generally able to shape the international order to their liking, despite several major disagreements such as Operation Iraqi Freedom. Non-Western powers, namely Russia and China, were often challenged, for instance with NATO’s eastward expansion, and repelled, as in the Taiwan Strait crisis in 1996. However, the occupation of the Pristina Airport in Kosovo by Russian airborne troops in 1999 demonstrated the political effect of fait accompli. Since the financial crisis of 2007, the ongoing economic struggles of the Western powers and the comparatively stronger performance of non-Western powers create a suitable environment for non-Western powers to develop the formula. In this formula, diaspora is for legitimacy and fait accompli is for a contest of wills. With similar ethnic or cultural backgrounds, a diaspora would be more likely to accept or even welcome an external military presence from their original country, particularly when they have the perception of suffering from unfair treatment. Thus the arrival of the expedition troops arrive brings less bloodshed and more friendly interactions. A diaspora provides a nice humanitarian guise to cover an invasion. Meanwhile, a fait accompli denotes that the expedition force immediately neutralizes most local defenses and creates a new status quo. In this situation, other powers that plan to restore status quo ante must be prepared to attack the newly deployed garrison and perhaps its home country. Despite multiple cases of intervention by Western powers during the post-Cold War era, playing a “liberator” role against a global or regional power in order to restore a “victim” country’s sovereignty is rarely welcomed by either decision makers or public opinion given its high costs, unless it involves very close allies or crucial interests. The current economic travails of the West further constrains their will and resources. Although the use of this formula has been limited to Eastern Europe so far, it could also apply in Asia. Given the large distribution of overseas Chinese communities and other communities that could be recognized as sharing certain ethnic or cultural links with China, Beijing may be able to establish the legitimacy of intervening into neighboring countries and achieve a fait accompli in the name of protecting citizens or other humanitarian causes. China’s growing soft power among the increasing number of Mandarin speakers worldwide through media and other means may substantiate the sense of belonging felt by overseas Chinese population and other audiences. Its growing airborne and marine divisions, airlift and amphibious capacity suggest the People’s Liberation Army (PLA) will ultimately have the ability to undertake such missions. Considering the extent of defense preparation and nation building, Taiwan and certain ASEAN countries could be potential targets for Beijing. Given that anti-government movements similar to Ukraine happen in Taipei, PLA’s instant deployment across the Strait, preceded by secret agents and special forces, could create a fait accompli in short order. Of course, just because a smaller or weaker state is situated near a major power, it does not necessarily mean the formula will be applicable. First, while an unstable domestic situation or humanitarian crisis provide legitimacy for external intervention, proper nation building and minority policies could comfortably accommodate diasporas and establish their loyalty to their country of residence. Undeniably, a neighboring power could reach its diasporas by propaganda, economic and cultural leverage, but good governance and an appropriate response could limit the influence. Second, while a lack of resistance would ensure a prompt fait accompli, a well-prepared defender could make that outcome much harder to achieve. Denial-oriented weapon systems, such as landmines and surface-to-air missiles (SAM), have the potential to slow an invasion. Along with good governance, a small state’s management of its armed forces to ensure their loyalty and combat efficiency is essential. For example, although Ukraine possesses a substantial military with several sophisticate weapon systems such as SAM, the inaction and even defection of Ukrainian units helped Moscow in its military deployment. Although the United Nations Summit in 2005 introduced the concept of the Responsibility to Protect, but as long as the Western powers are more obsessed with domestic issues than with maintaining the international order, a formula combining diasporas and fait accompli presents a feasible policy option for other powers to secure or expand their external interests.